3 Bedroom Terraced House For Sale in Falmouth for Guide Price £500,000. Barn Cottage was once an old calving shed which was converted in 1986. It was originally part of the Trevissome Country Estate, once owned by Captain Dowman who purchased and rescued the famous Cutty Sark which now stands proud in Greenwich, London. 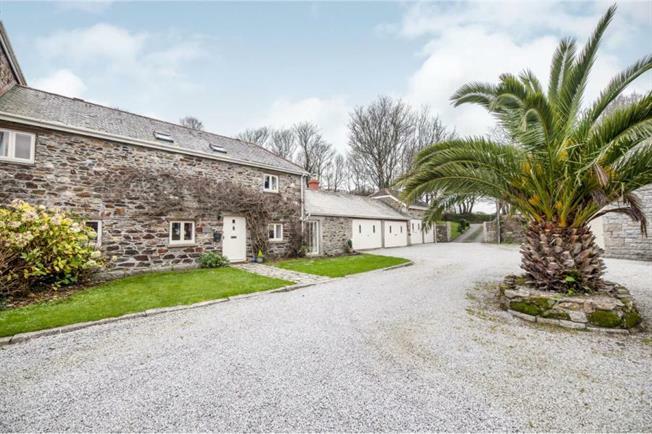 'Barn Cottage' is located within this picturesque courtyard in the hamlet of Trevissome which is found between the stunning harbour side village of Flushing and the sought after residential Creek side village of Mylor Bridge. A sailors paradise, Barn Cottage is just a short stroll from the moorings, boat-parking, and slipway at Trevissome House. Range of wall, drawer and base units together with display cupboard, attractive worktop with under counter lighting and inset 1.5 bowl stainless steel sink unit with mixer tap over. Built in oven, space for fridge freezer, washing machine, tumble dryer and dishwasher. Room for table and chairs. Beamed ceiling. Open galleried staircase with front door to rear garden on half landing, further staircase to first floor. Consumer unit. Tiled floor. Door to Living/Dining room and door to ground floor bedroom. This a stunning room with part vaulted ceiling. Fireplace with slate hearth and some exposed granite features surrounds, wood burning stove. Windows to front and rear. Engineered wood flooring. Radiator. Dining area with room for table and chairs. Good sized room with windows to front and rear. Laminated flooring. Beamed ceiling. Radiator. Turning staircase from kitchen leading to half landing with front door exiting onto the rear garden, further turning staircase to first floor landing. Doors off to bedrooms. Airing cupboard. Radiator. White suite comprising Double shower enclosure with sliding door, pedestal wash hand basin, WC. Radiator. Velux window. Extractor. recessed lighting. Light and shaver socket. Part sloping ceiling. Panelled bath with shower over, shower screen. Pedestal wash hand basin. Radiator. Velux window. Light with shower point. Part sloping ceiling. Loft hatch. Airing cupboard. Good sized double room, window to front aspect. Velux window to rear. Radiator. Built in wardrobe. Generous decked area with a further garden area of hard standing. Barbecue area. Lawn. Pond. Loose gravelled area. Small summerhouse/potting shed. Detached studio. Further area with double opening gates to rear parking area for two cars. With light and power. Double glazed window and door. Pitched roof. Pitched roof with light and power, floor mounted oil boiler. Double wooden doors. Parking to front.